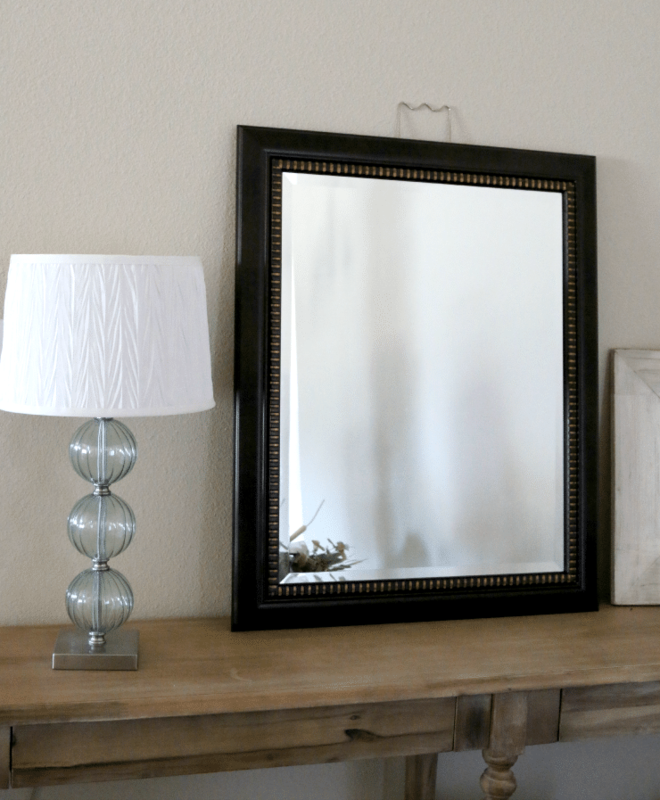 30 Minute Chalk Paint Furniture Makeover: Mirror ! Alright everyone. I know this post will be a bit unusual from my recent holiday crafting fun, but…oh…I did something awesome and I want to show it off. 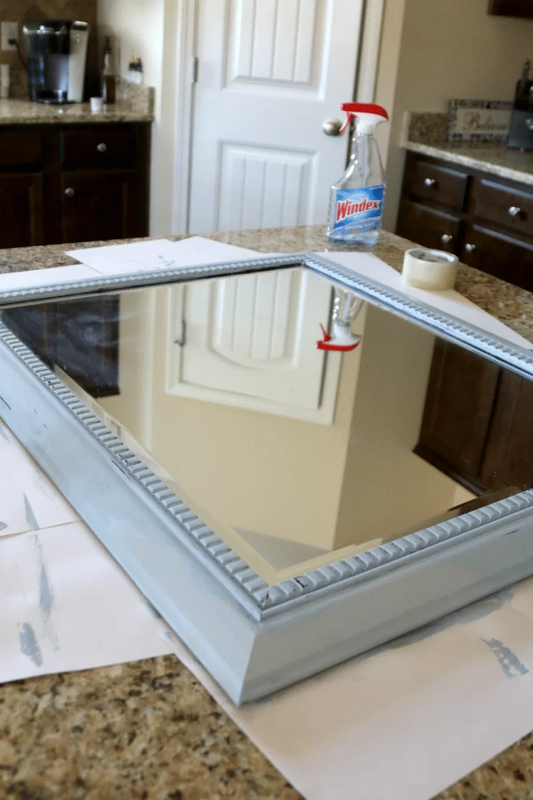 If you are anywhere online you have no doubt seen all the DIY furniture tips and how to give new furniture more character and how to use chalk paint, etc. etc etc. I save those things like a mad woman in a secret Pnterest board. I figure no one wants to see me pin that all day. 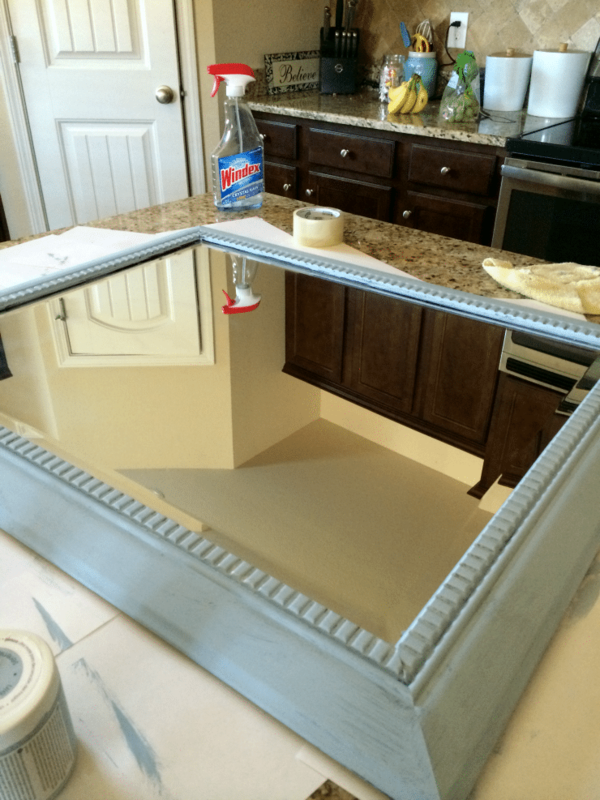 And about 3 weeks ago I was in Hobby Lobby and walked by, dum dum dum…chalk paint. That stuff is no joke expensive, but I bought a little can and its been sitting on my shelf mocking me. So yesterday I took out a paint brush and did the old “wing it” scenario. I had done my homework in that the paint needed no prep and since I was taking a dark piece that I had junking up my floor and making it a “shabby chic” type look, I figured- eh, if I screw it up, I’ll just throw it out. Thankfully this makeover turned out to be SO easy that now I think I am addicted. Pretty soon Ill be dumpster diving for crates and old pieces of wood and shopping a show on the Home Network. But for now, before I get famous and all that, check out my mirror makeover! First- the old mirror. 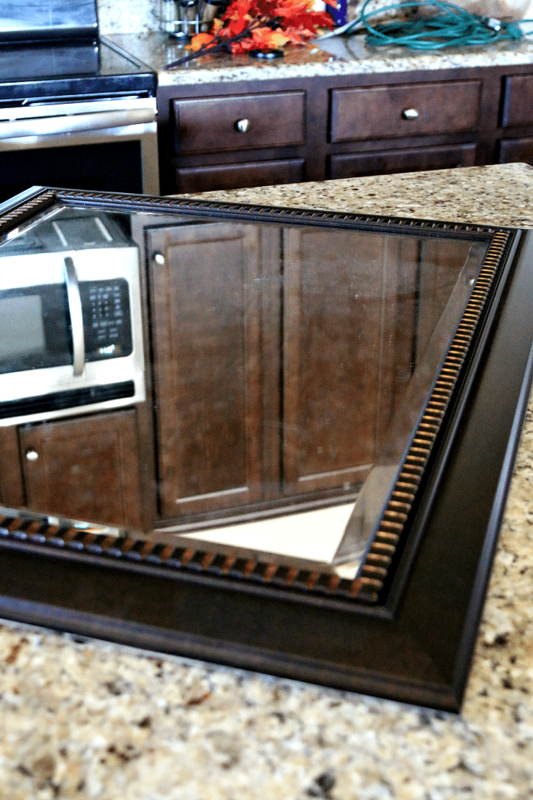 This was just a random mirror that we had in our guest room at our old house. I got it from Marshall’s I think. As you can see it matches NOTHING. It used to match our guest room where I have a bed set this color, but we haven’t even touched that room since we have moved! Its like a “catch all” junk area. 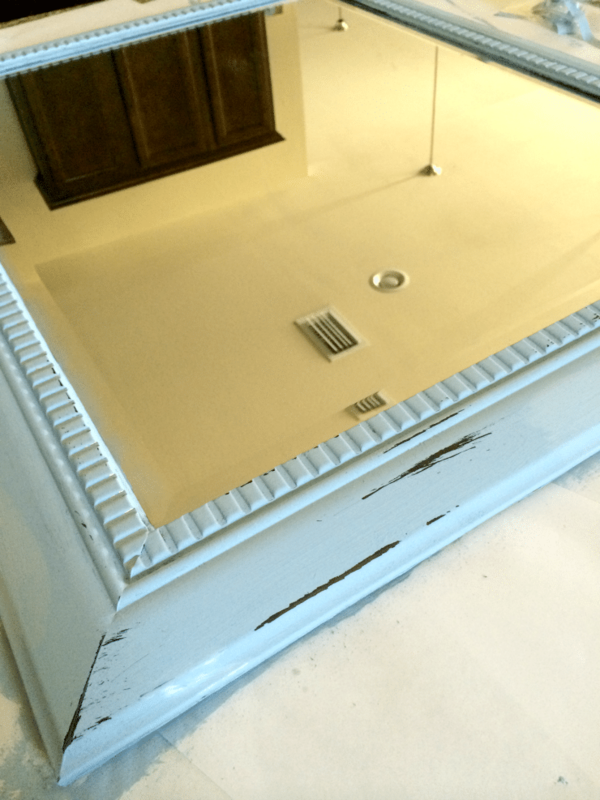 Here is the paint I used, its Americana Decor in Chalky Finish. Now all I did was lay it on my counter and paint! I used regular tape instead of painters tape (as I could not find any) to keep as much paint off the mirror itself as possible. I put some printer paper down so the paint didnt get on my counter as I did the corners. I know there are about a bajillion tutorials on when to use wax and how many layers and all of that- but I did the 30 minute easy peasy at home version. Once it was dry, I took a piece of sandpaper to remove random pieces of paint and let the dark shine through. In a few places I took off more than I wanted on one side and just repainted over the scratch. 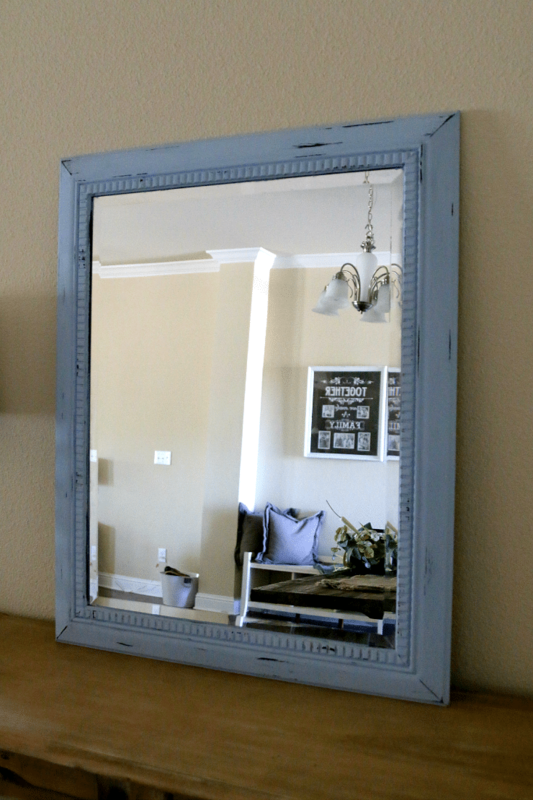 Now the newly painted Mirror has earned its spot back on the table and out of the garage sale pile. To sum up- Chalk paint, 2 coats, then sand paper off in spots till you find the look you are going for, the end! I love that this was using a can of paint. 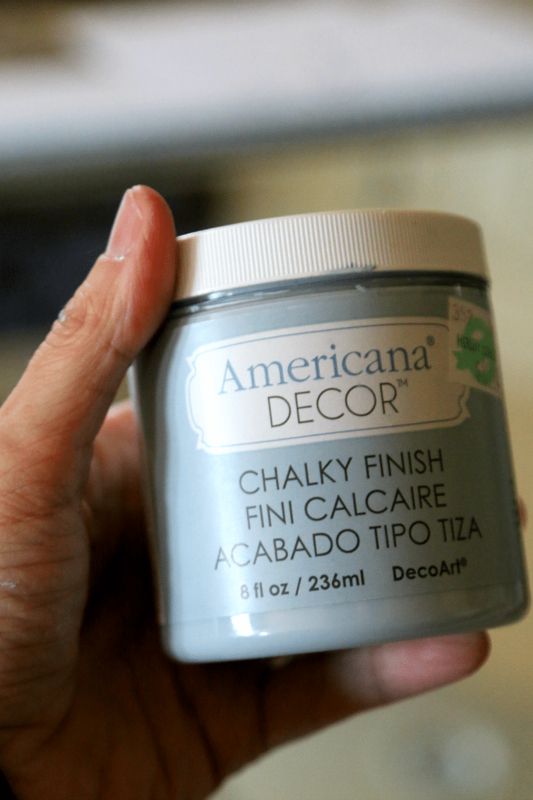 I keep seeing make your own chalk paint directions and that was enough to scare me off!